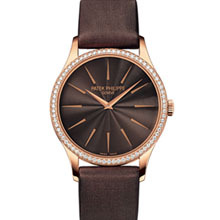 Patek Philippe’s presents a new interpretation of its ultra-thin ladies’ Calatrava Ref. 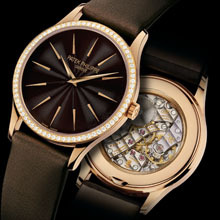 4897 in a warm 18K rose gold case, a dial with a bittersweet chocolate hue, and a bezel adorned with 72 Top Wesselton round diamonds. It is a mechanical opus that redefines seductiveness. The growing interest of women in artisanal horology is evidenced by the success of the ultra-thin mechanical Calatrava for ladies that Patek Philippe launched three years ago. To accommodate demand, this watch is now being launched as Ref. 4897R in 18K rose gold. The case shape of the Ref. 4897R reflects the sleek lines of the Bauhaus philosophy: form follows function is the leitmotif of all Calatrava models. Its personality mirrors classic elegance not only with its focus on the display of hours and minutes but also with the 72 Top Wesselton round diamonds on its bezel. Here, eternity subtly contrasts with the constant course of time. This antithesis takes place on a dramatic stage that glows in the dark brown hue of bittersweet chocolate. On the dial, the concentrically guilloched wave pattern interacts with a rich brown to create a fascinating impression of depth. The applied arrow-shaped hour markers and the faceted hands in rose gold appear to be suspended in mid-air. The Calatrava Ref. 4897R is powered by Patek Philippe’s manually wound caliber 215 mechanical movement. Although it is ultra-thin and highly compact (height 2.55 mm, diameter 21.90 mm), it fulfills the rate accuracy requirements imposed on all of Patek Philippe’s mechanical movements. The Calatrava Ref. 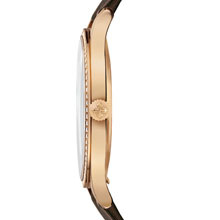 4897R for ladies in 18K rose gold replaces its predecessor, the Ref. 4896 G with the white-gold case and deep blue dial. The sheer beauty of the new model, its discreet radiance, the 6.35­mm thick case, and its rich inner life endow this ultra-thin Patek Philippe Calatrava with all the facets it needs to become a celebrated paragon of feminine elegance. complement: Bezel with 72 flawless Top Wesselton round diamonds, diameter 1.2 mm, total approx. 0.47 ct.